Asher College’s Sacramento Campus opened its doors in 1998. We offer you the kind of focused education and training that sets the vocational college apart from traditional schools. 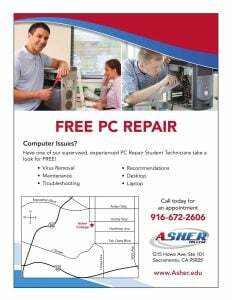 Asher has built solid connections with employers throughout Sacramento and surrounding counties. Some employers we partner with include: Robert Half Technology, Envisions RX, CVS, Blue Shield, PG&E, State of CA, Intel, Sutter Health, and Coram Healthcare. As a student at Asher College, you will have access to our facilities and resources, personalized instruction from experienced faculty, hands-on training, and the support of staff and fellow students, and as a graduate of Asher College, you will be positioned for numerous employment opportunities. Asher College is indeed a nice place to acquire the skills and knowledge one needs. I really enjoyed every moment I spent in Asher College both the staff and the students are awesome. Asher College is a place where you feel at home, feel welcomed and relaxed to learn.